One of the best parts of our jobs as DC wedding photographers is preserving cherished family traditions on film. Weddings, whether in Washington or outside the DMV, are ultimately a celebration of family. In essence, a marriage is the bringing together of two familial groups to create a new one. A new nuclear family comprising the two people who come to their DC wedding venue to tie the knot, naturally. But a matrimonial celebration also gives birth to a much larger clan that includes the bride’s and groom’s extended families. New relationships among the various in-laws often get their start on a wedding day in Washington. A lot of the candid wedding photography that we take for our brides and grooms focuses on those moments. In a very similar way, a Washington wedding celebration also gives rise to new family traditions. In their married lives, most brides and grooms meld their own particular cultural and religious customs with those of their new spouses. It is a lifelong process that often begins during the lead-up to their exchange of marital vows. When planning their wedding, DC-area brides and grooms often have to delicately negotiate the inclusion of their different family traditions in the celebrations. For that reason, most DC-area weddings that we photograph feature a mix of elements from each side’s family background. A smart Washington, DC, wedding photographer makes sure to record all of it so that no one feels left out. Because our approach to DC wedding photography is photojournalistic, we are always on the lookout for these elements. We want the photographs that we produce to tell a story. We want them to narrate not just the events of a couple’s wedding day, but also their love story. Someone who has never met them should be able to look through their wedding album and understand the connection that binds them. A Washington, DC, wedding photographer's images should also communicate what made their marriage celebration special and different. For that to happen, the pictures need to be personal. They need to include things that are distinct about and particular to that Washington wedding. That is where each bride’s and each groom’s individual family traditions come in. Those are the elements that personalize wedding photos and make them special. Little touches like a picture of the groom’s grandmother pinned to his lapel. Or like the bride wearing her mother’s wedding dress. Or like the groom sporting his grandfather’s cufflinks. Or like the couple passing the wedding rings to each wedding guest and asking them for a blessing. Or like the father of the bride changing the lyrics of a popular song to include a reference to her mother. In the case of this particular DC marriage celebration, one of the personal touches was the bride’s garter. It was something that her grandmother wore on her wedding day and that that family member wanted her to have. Because we had spoken to the bride extensively during her wedding preparations, we knew pictures of the garter were imperative. And more importantly, we needed to photograph the moment when the bride received the keepsake from her grandmother. Armed with this knowledge, we were ready and in position to take pictures when the moment arrived. We opted not to focus on the faces of the bride and her grandmother. Instead, we used a lens with a higher focal length to captured just their hands on film. 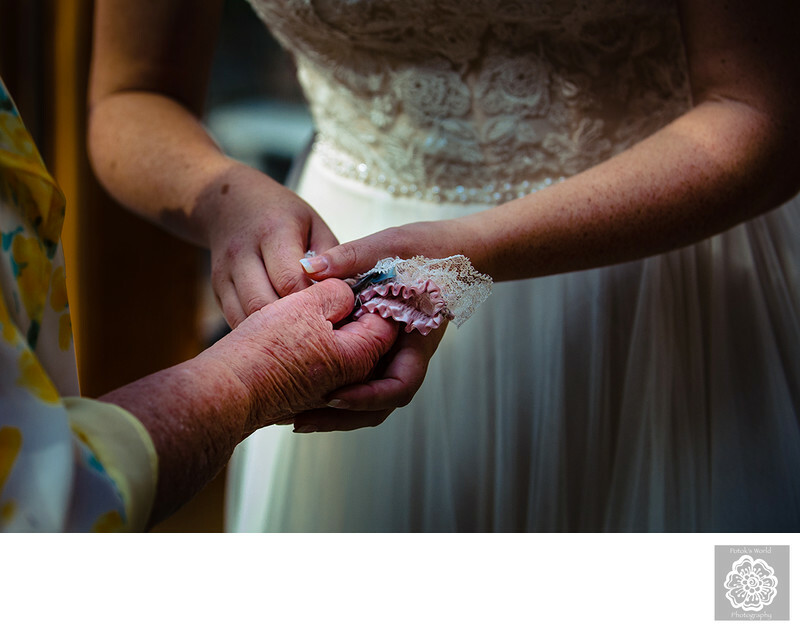 We wanted it to be completely clear what the grandmother was passing to the bride-to-be. And in our professional opinion, the obvious differences in the appearances of their hands makes showing their faces unnecessary. There is no doubt about what is happening in this image of a DC bride.